Keep writing as well in 2017 as you have in 2016. Hi Rachel, this just arrived in my in box after I did your pumpkin risotto (well, squash in my case) for lunch, so nice timing! Feeling smug because I had already secured my Christmas cannellini bean supply in the pantry. Shopping today for the sweet and sour onions for Christmas eve. Thank you Rachel and I will follow the Christmas “advice” you shared! Once the great feast is over I’m going to make the Pumpkin ravioli from your last Guardian column. Really looking forward to the new book. Merry Christmas and happy new year to you and your family. I’ve saved your bean feature from the Guardian…didn’t have time to read it yesterday. The Vendée is also a land of beans…mogettes and the wonderful demi sec beans that I’m mad for. I’ll be using mogettes in goose fat ..probably with duck ….have a lovely Christmas and thanks for all the enjoyment you have given with your writing. I continue to love your writing but don’t see it often enough. Any chance you can upload the Guardian columns each week — or arrange for a weekly link to be sent your subscribers? You laid down the challenge. On Christmas eve we’re cooking lots from your 15th Dec Guardian piece: porchetta, lentils, spinach, mushrooms. The idea is also to please and not only include vegetarians… Substituting pumpkin risotto for the ravioli (saving that for another time when we have a machine). Plus a big green salad. In Yorkshire Dales with Storm Barbara due…thanks for the inspiration! Like your stuff. I wish you would do more Rachel Eats. I don’t see the Guardian. And, yes, I always keep white beans in the cupboard. Just finished up work for the year, and so nice to get this piece of writing into my mailbox….framed my thinking for the next few days, it’s been hectic and I need to remember to stop and take a look at those winking lights. Love your writing, favourite bit of the guardian for me and looking forward to your seeing your new book. Never commented before, but I’ve been a long time reader, here, and now in the guardian, and of course in the book. I work in Carmelite house and spied you in the reception a few weeks back and it’s one of the headiest sights I’ve seen there! Just to let you know you’re much appreciated – merry Christmas to you and yours! Congratulations, Rachel, on the well-, very well-deserved awards and WOOHOO to the thought of another Rachel book. I know I, and those I gave your first one to, will love it. I wish you and those you love a healthy, happy year filled with laughter and satisfactions. Now THAT is something to really look forward to! Thank you for the thought. Anticipation is a huge part of pleasure. Congratulations for awards! I love your book (i wait for second). This is one of my favorites. I love that simplicity, lot of sun on every page, little stories. I love to know about meals that i cook. I miss you here, on blog but i read you on Guardian 🙂 Merry Christmas! I love your column in the Guardian, read it without fail & have made many of the recipes. Having spent many holidays in Rome over years, we always stay in aTrastevere, we actually got to the market in Testaccio a few weeks ago, something I have been promising myself I would do since I first started reading your blog years ago. 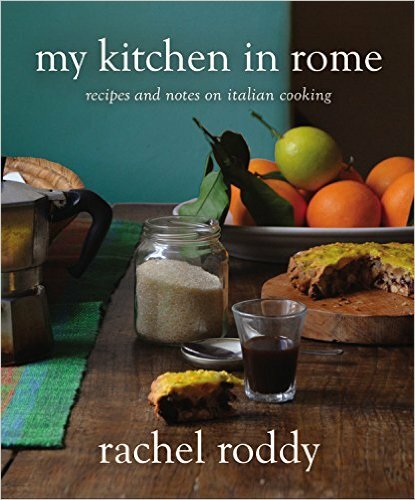 Looking forward to your new book, My Kitchen in Rome was mentioned on the Italy Magazine website a few weeks ago in an article called ‘ 7 Great Italian Cookbooks’. I found you in the Guardian a year or so ago, and soon bought Five Quarters. You’ve inspired me, and re-energised my cooking after several years of doldrums; you’ve sent me back to Elizabeth David and Jane Grigson, and introduced me to Anna del Conte. I love your recipes and your writing. I’m grateful: thank you! Right Rachel, It’s NYE. Fiona is off at home in Ireland with the boys and I’m about to read, ‘this’. If it’s baked beans, then I’ll be farting myself into the new year – but I’m prepared to take the risk! Thanks for your writing this year. See you on the other side. Hi Rachel, I just stumbled upon your blog by pure accident and I must say I LOVE IT. Keep writing as I am curious to learn more!! !